On a quiet country road, but close to everything - restaurants, the quaint villages of Warren and Waitsfield, covered bridges, unlimited outdoor activities. One mile to Sugarbush ski slopes, seven miles to Mad River Glen, cross country skiing nearby. Snowshoe right out the back door. Golf, hike, bike, fish, canoe, explore the countryside or just loaf on the big front porch or back deck. Green mountain long trail only minutes away. Our nine acres of woods, meadow, gardens, pond abuts Sugarbush Robert Trent Jones championship golf course. Fall foliage is spectacular! A great old farmhouse with all the charm that age brings, but with amenities appreciated by guests - private bathrooms, premium linens, down comforters, good reading lights. Eight guestrooms, all with fireplace, gueen or king beds, phones, DSL internet access. Cable TV/VCR great VCR library. Lots of books. Three big common areas with fireplaces. Dinners by reservation for six or more guests. 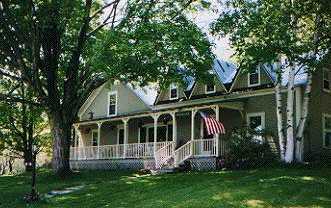 This and other Warren Vermont Bed and Breakfast Inns can be found here in The Register.